The McVicker Laboratory is located at the Salk Institute for Biological Studies in beautiful La Jolla, California. We are part of the Laboratory of Genetics and the Integrative Biology Laboratory. We are also part of the Bioinformatics and Systems Biology program at UCSD. 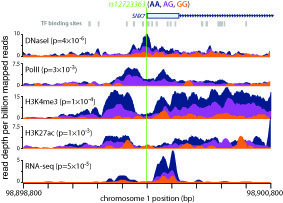 The McVicker laboratory studies how human genetic variation affects gene regulation by combining experimental approaches with computational analyses. We are especially interested in identifying pathogenic regulatory variants that act in immune cells and cancer cells. Currently, we are developing new tools to discover somatic regulatory mutations in cancer genomes, and manipulating cell lines with high-throughput CRISPR technologies to discover new regulatory sequences. In much of our research, we develop sophisticated computational and statistical methods so that we can extract subtle signals from noisy experimental data.